Published on October 31, 2009 in Events, Internet Marketing, Preeminence and YouTube. 0 Comments Tags: 2009 Bootcamp, Bootcamp, Bootcamp Testimonials, Exponential Bootcamp, Testimonials. If you want to check out a few testimonials from the 2009 Exponential Business Building Bootcamp, you can see them at the Business Mastery Channel on YouTube. I’ve uploaded about 20 in all. You’ll start to see a LOT more YouTube videos from me and our clients. I’ll be explaining why this is such a powerful Internet Marketing Strategy at the 2009 Exponential Internet Marketing Bootcamp in Melbourne at the end of November. You don’t want to miss this once-a-year-only event… Preview events are coming up in Sydney and Melbourne… Click here to attend. Want MORE Leads – Give MORE Testimonials! Published on March 17, 2009 in Exponential Mindset, Internet Marketing and Preeminence. 4 Comments Tags: Exponential Marketing, Internet Marketing, Marc Dussault, Testimonials, Yvonne McIntosh. You know all about my 1 percent improvement doctrine, which simply says that 1 percent per day compounded daily gives you 3,778% return in one year. Today’s post shows you how easy that was to do with ONE SINGLE TESTIMONIAL in LESS THAN ONE MONTH that PRODUCED ONE QUALIFIED LEAD for the person who gave me the testimonials. The first lesson to be learned is that I asked a few clients for testimonials. If you don’t ask, you don’t get. 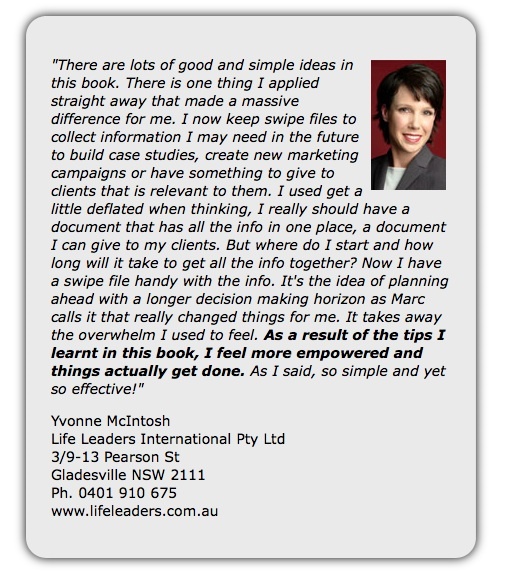 I needed testimonials for my e-book “Get The Best Business Results For The Least Amount Of Effort“. Yvonne gave ME a testimonial and SHE got the lead. That is where the saying “give and you shall receive’ comes from – on the Internet it is EXPONENTIAL and extremely wide-ranging. I explain this and other Internet Mastery Techniques at our annual Bootcamp coming up in July 2009. So go on, give someone a testimonial today or this week and see what happens to YOUR RESULTS!! !